If you are new to the site my models are updated weekly. Less than one third of this sector’s 122 companies earned any money in the last 12 months. The last 2 years gains in the wider US markets were approximately 80% multiple expansion and 20% earnings growth. The justification for the multiple expansion was (1) ‘Fed policy trumps all’ and (2) stocks frontrunning a ‘normalisation’ in economic growth and earnings. Now: QE is being wound down, Q4 2013 GDP and Q1 2014 GDP estimates are being revised downwards, earnings estimates are being revised downwards and for Q1 2014 82% of companies so far have issued negative earnings guidance. Those justifications have largely evaporated. The lesser known reason for the big run up in price into the end of 2013 is the speculation peak driven by the solar maximum, and this was shared in the superpeaks of Dow 1929, Nikkei 1989 and Nasdaq 2000. A reminder that there are 3 ingredients for a superpeak: (1) speculative mania by solar maximum (2) increasing number of buyers through demographic swell and (3) increasing use of leverage amongst buyers. Both (1) and (3) apply to the current US markets but (2) is absent. There is a shrinking rather than swelling demographic pool, and for that reason we do not have a supersized peak. Otherwise, the analogies are very much applicable. In 2013 US markets ran up in a parabolic shaping, generating historic levitation above moving averages and producing an anomalous lack of a ‘proper’ correction. Sentiment reached levels not seen since previous major peaks, and euphoria only historically exceeded in the dot.com boom. We have reached valuation levels in the Q ratio equivalent to the TOP in 1929 and in stock market capitalisation to GDP equivalent to the TOP in 2000. Leverage levels equal the TOP in 2000 as measured by margin debt to GDP and beat the 2000 top in other measures. The blow-off topping process in the current Dow so far mirrors that shared by the 3 analogs, and the peak-to-date occurred at the solar maximum. In short, the ‘size’ of the peak in current US markets does not compare to the analogs because of the key demographic difference, but in many other ways these analogs are particularly apt. 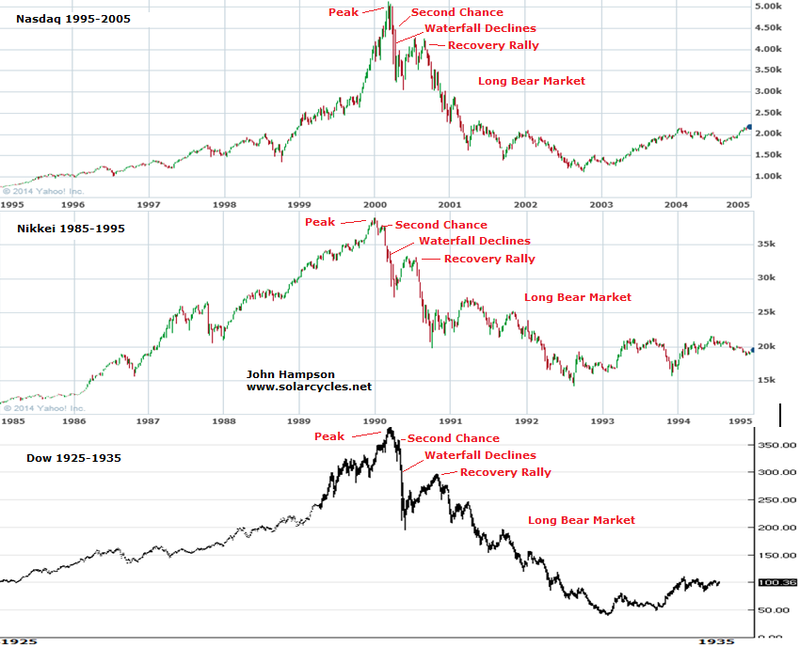 What comes next in the analogs is waterfall declines, and we have a case for the same in the current US markets due to (1) historic levitation away from moving averages or parabolic rise on long term view (2) historic time since significant correction and historic compound gains and bull duration (3) 80% multiple expansion 3-pronged justification case shattered (4) ‘all-in’ measures of sentiment, leverage and fund flows ripe for unwinding. We are likely through the solar maximum peak and the speculative excess into the peak is now vulnerable to pop. 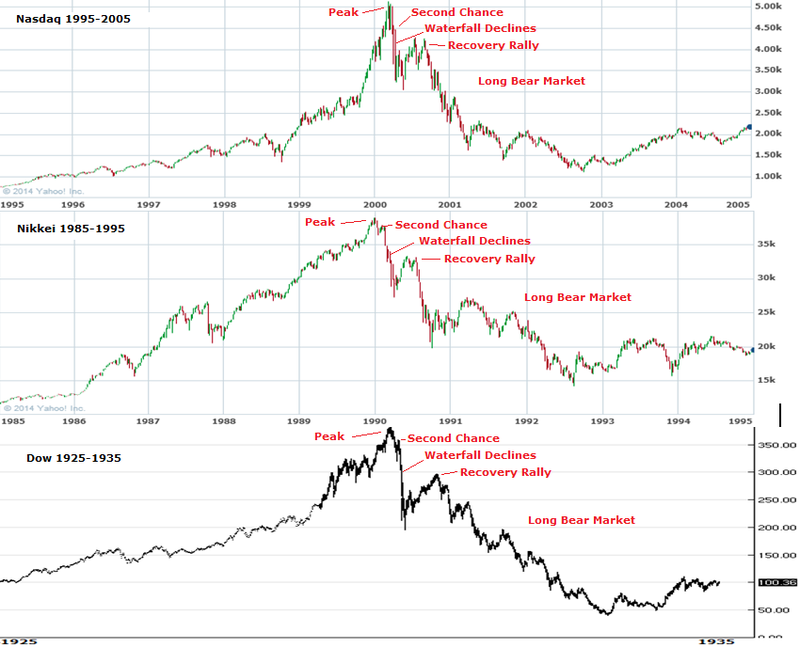 Nikkei 1989: Waterfall declines from second chance lasted about 6 weeks, centered on March (geomagnetism (inverted) seasonal low), and took off 27% from peak; Recovery rally then lasted 3.5 months from April to July, back up 20% (through seasonal high); Then 2.5 months more waterfall declines, mid July to beginning of October down 40% (through seasonal low). Dow 1929: Waterfall declines from second chance lasted 1 month, centered on October (seasonal low), and took 48% off from peak; Recovery rally then added back on 50%, lasted 5 months from November to april (through seasonal high); Then long period of declines lasting a couple of years. Nasdaq 2000: Waterfall declines from second chance lasted about 6 weeks, March-April, and took 36% off (seasonal low); Recovery rally lasted about 3.5 months from May through to beginning of Sept, adding back on 34% (through seasonal high); Then long period of declines lasting a couple of years. So, averaging them out and applying to the current US markets, we could expect waterfall declines of around 35% lasting around 5 weeks, and this should occur in the seasonal low of March-April. That would then be the time to take off short positions for a recovery rally of around 35% lasting around 4 months from April to August or so, through the seasonal high. A second set of steep declines should then unfold through the seasonal low of September-October. By that model the initial waterfall declines should wipe out all of 2013’s gains in the space of a month. I refer you to the case for waterfall declines further up the page as to why this is reasonable, and I suggest the consensus view once this occurs will belatedly point to similar factors. However, once the recovery rally then erupts, as can be seen from the 3 analogs on the 10 year view, it will keep the ongoing bull market option in play. I suggest 1987 will likely be quoted as benchmark: a harsh correction that was a golden buying opportunity. But, once the recovery rally tops out short and rolls over into more steep declines, there will be broad acceptance of the new bear. What will happen to commodities under waterfall declines? Understand that such unforgiving drops will bring about forced liquidations as leverage is unwound so there will be some blanket selling. In all 3 analog waterfall decline periods, commodities (including precious metals) fell too, whilst the US dollar largely rallied. The same occurred in October 2008’s sharp falls. That suggests it may be prudent to pull back on or even exit commodities long positions once we get a whiff of steep declines erupting. Previous major commodities peaks have been speculative to a large degree, but also typically founded on a fundamental supply/demand case. For energy and industrial metals the latter is currently weak, and we see oil and copper in long term ranges rather than in major breakouts. Various soft commodities have enjoyed steep moves up as shorts have scrambled to cover, but whether there can be an enduring supporting story this year remains to be seen. I am skeptical as to whether commodities as a class can make a major rally to beyond 2011’s CCI peak this year, anticipating they may sell off under the waterfall declines and perhaps struggle for a case under deflationary recession fears. However, maybe they can outperform during the ‘recovery rally’ over mid-year and particularly if the US dollar is less seen as a safe haven this time, so I remain open to the possibility that maybe they can beat 2011’s peak, but currently see this as less likely. The case for previous metals differs from other commodities, and as I have outlined before I see gold’s 2011-2013 bear as a pause in a longer term secular bull market likely to terminate at the next solar maximum. My tactics will be to reduce all commodities long positions bar precious metals once it looks likely that equities are on the cusp of waterfalling, anticipating some blanket selling across all assets in that period, and then review again as we approach the end of that event. Looking back to the Great Depression, banking panics began in 1930 and swapping dollars for gold in 1931. In other words, it took time for things to unfold, and I would expect similar this time around. Whilst I cannot be sure, I do not expect a sudden chain of bankruptcies under the first waterfall declines, but for the real ‘trouble’ to unfold gradually and likely after the recovery rally peaks out. First things first then: I expect a major short equities opportunity to unfold swiftly from here through March and into mid-April, and am positioned for that. I will be looking to exit all equities shorts as I try to time the end of that event. Very thorough analysis John. I am watching for the signs of exhaustion. Today’s action may be the first sign as you said. I’ve been thinking that this time around, a steep drop might take away all remaining confidence in monetary stimulus, and the recovery rally might not happen in stocks, perhaps PMs instead. That would fit in with what the EuraDollar COT report is forcasting (per McClellan). That analogy shows the steep decline, but no recovery for the remainder of the year. It’s flat-lining, and that’s unprecedented in its history. Just be careful. Tapering brings volatility. 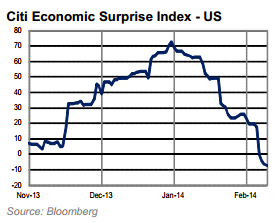 But tapering is still stimulus. I believe that it is the rate of change or delta that matters. With a taper, it is negative. You are fighting $60 billion a month. Emerging markets are in decline. That means commodities are in decline. You will also have a disinflationary stimulus as a result. Japan has one last run here. I would be extremely extremely careful here. That being said, the more they push up the s&p 500, rut, etc., the greater will be its fall. The post states that we could expect waterfall declines of around 35% lasting around 5 weeks occurring in the seasonal low of March-April. Then there would be a recovery rally of around 35% lasting around 4 months from April to August or so, through the seasonal high. A second set of steep declines should then unfold through the seasonal low of September-October. Also stated for the 1929 chart is that a recovery rally then added back on 50%, lasted 5 months from November to April (through seasonal high); Then long period of declines lasting a couple of years. Do you expect a big bounce off the October lows that last from Nov 2014 to Apr 2015 (through the seasonal high). If so, how big of a bounce? Cross that bridge when we come to it. Currently the Nas Comp and Nas 100 are at marginal higher highs on negative divergences, whilst the SP500 has triple topped and the Dow and Russell are on lower highs – i.e. all acceptable topping types. It would take a decisive joint breakout upwards on positive internals for me to think the top is to be postponed. John your research is worth a million and I appreciate it very much. But it is interesting that Goldman Sachs goes in completely opposite direction…. I wouldn’t give GS’s the time of day given their history? Say one thing, do another is their policy. Goldman Sachs is run by some very evil people. Believe their predictions at your own peril. But they said they are doing God’s work. Are they lying? I have noticed that they put out reports near market extremes predicting a continuation of the current extreme oil to $200 back in 2008 and gold above $2000 in 2011. They use this excitement to distribute their longs and establish their shorts. 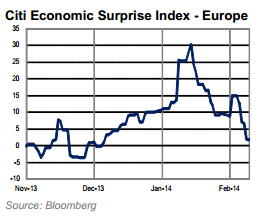 MFGlogal going long European debt during the crash is instructive. Corzine is of their ilk. Thanks for heads up guys. I am not sure if Grady Means can be considered a good source for the financial projections, but this article was written on Oct 25, 2012 and is in line with John’s dates. Gold has broken above it’s 50wma. Coincidently the 200wma is at 1500. A level that was the breakdown price last April. What are te odds that gold takes a surprise trip to test that level before retreating? I have 1350 as the next test on my chart, let’s see how it gets on with that first. Bear capitulated. Look at RWM, Yesterday volume approximate high in 3 years. No more short covering buyers left standing in town. This is the safe shorting opportunity when John’s work weighs in.. Mean aversion will play out and throw the Russell bulls off the boat. .
That would be an insane move and I cant imagine CB standing pat to something like that. Also in todays worl we have so many products (vix related) which will go crazy if anything like that happens. So with a small april put options you can become real rich and market wont let it happen so easy. I wish your predictions are correct and positioned accordingly. First test is monday march 3rd. I’m afraid you are right in that the markets won’t allow that dream to come true. The repeated posponement of the „waterfall decline“ in Johns articles may only serve to maintain the wall of worry for the bull market to continue, unless $oexa200r continues to ominously follow the July 2011 pattern and CAC40 reverses its still not significant breakout. 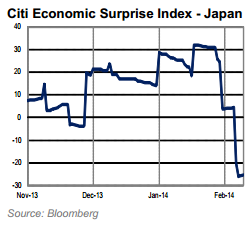 Waterfall declines can’t be stopped by a central bank. They happen fast and selling begets selling. It’s the unwinding of the extreme leverage. John your thoughts about ZH focusing on correlation US equities between USDJPY. I’ve been watching that relationship myself. JPY seen as safe haven, USD not, which is why it’s no done deal that under sharp declines in equities the dollar would rally this time. We shall see. Mat, not to be picky, but did you READ this article at all? If steep market falls, then forced liquidations and I’d expect all to fall to some degree. The IBB chart just demonstrates irrationality of the human herd. Time and time again! Check out ILMN. Just astounding. Would not be surprised for it to fill the breakaway gap around $82/share this year. So many dumb speculators are going to get crushed! Best of luck, John. I hope you don’t get squeezed out of your positions before the likely windfall. What if John you were wrong? I am not suggesting you will be, but picking a top and betting on it in a high momentum market must be as dangerous as WW! trench warfare. I wish you well and thank you for sharing your research. That’s the money management part. I’d consider ‘wrong’ to be equities moving significantly higher and for significantly longer. Were that to occur then we would either see indicators becoming even more historically extreme (I would short more), or gradually repairing through underlying improvement (I would adjust my positioning). Everything is possible, I just try to make a case for the probable. Pricing power and top line growth. Sorry John but ths is how it looks to me. Monday’s break to new highs on volume was back tested successfully yesterday. Futures are currently up strongly and look suugestive at this stage of new highs. With Fed POMO between 10.25 and 12.5 billion this week I just can’t see how this market can see much downside. European markets appear to be on the verge of new all-time highs also. I wish it were not the case, as I would dearly love to short this market, but I genuinely can’t see how this market can buck the Fed anytime soon. Just to add that with Mercury RX reversing on Saturday any move, either up OR down should set the new intermedite term trend. For this reason I remain open minded to a reversal here. It could potentially squeeze out a bit more by price and/or a bit more by time, but put simply this is “sell high”. Thanks for the many interesting articles. Do you have in mind a catalyst that could produce such a decline? I thought the debt ceiling may have worked but struggling to fibd another reason. No specific catalyst of that nature required I believe. If the SPX remains above 1737 odd on a closing basis then the larger bull is still in play. We may see 1860-1880 now before another pullback and as long as 1825 holds (weaker level but still one to watch perhaps) we could see 1950-1970 over the next few months. You know from previous posts that I am not long in anything much except HUI, and I am not chasing anything here, but these price levels should give some areas to watch. I am not a fan of comparing historical chart patterns with current ones and seeing similarities (or not) so I tend to stick (rightly or wrongly) with price action. Again, the scenario you describe is bound to happen sooner or later, but the 1825 and 1737 numbers reduces (for me) the need to try to call the top. Lastly, everyone expects the March-June period to be weak (well, I read that all the time) and in that scenario it would take something else to induce enough fear, just like in January/February where everyone expected the correction we did in fact get. The distribution has been going on for about 6-9 months now (my own feeling) – so just need a little more to get before the selling starts in earnest? According to an experienced market strategist hedge fonds will try to preserve or better improve their positive february performance by buying stocks during the rest of the month, neglecting bad economic data. If they don’t manage to create a decisive break out of the major indices this week, a new trend could evolve in early March, when this supportive buying pressure gives away. Currently the weekly $oexa200r is slightly below the downward sloping 10 MA and the higher 30 MA and thereby expressing weak breath. This is akin to the 3rd week of July 2011, when this breath index only managed to rebreak slightly above the 10 MA before falling steep. RSI and MACD are looking very similar now and then. Combining this chart picture with the alledged efforts of the hedge fonds we may even see new highs in DAX, CAC40 and SP 500 this weak. As long as these highs are not significant chances are, that the period after the 3rd week of July will repeat beginning next week. Failure of the weekly $oexa200r to rise significantly above its 10 MA in the coming days, would strongly support Johns comprehensive case for an imminent and violent trend change of the stock indices. Unfortunately the cumulative A-/D line has not shown any divergence yet and the RSI is slightly above 70 like in the first week of July 2011. Also just to add, I am watching China, they have had a strong bounce over the last 2-3 weeks but I wouldn’t be surprised to see some weakness and negative surprise there imho. The unrest in the world is interesting since we are around the solar max. Tops frequently occur at lunar eclipses, April 15. Gann Global’s last gasp top for commodities per their index and the 60 year Master Time Factor cycle is Apr 19th. He called the great bull market for commodities in 1998. Mysteriously, he seems to have become long term bullish even though the MTF say commodities flat to down for 15 years. Most commodity indices topped in 2011. The bottom should be around 2030.